Skylum’s latest Luminar 3 release marked a big change that made Luminar a complete all-in-one photo organising and non-destructive editing tool. It’s now announced a companion version – Luminar Flex – for photographers who want to use Luminar’s extensive creative tools and filters with their existing workflow. Luminar Flex will work as a plug-in for Photoshop, Lightroom Classic, Photoshop Elements and even Photos for macOS. It offers the same 50+ filter effects as the current Luminar 3 software, customisable workspaces and more than 70 one-click ‘looks’ – including some new ones for this release, we’re told. It's especially interesting for Lightroom users, as it adds filters, effects and tools you can't replicate in Lightroom itself, despite the huge range of free Lightroom presets out there right now. Luminar's AI Sky Enhancer can transform dull skies without masks or complicated user adjustments. In an interesting move, Skylum has decided to split these two products, with two development roadmaps going forward, and as two separate purchases. 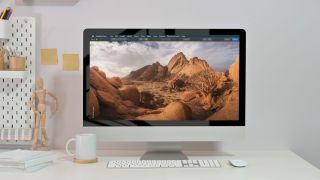 Luminar will continue to offer an all-in-one photo organising and editing program for users who want a single, complete program for all their photo editing needs, while Luminar Flex will work alongside Photoshop, Lightroom, Photoshop Elements and Photos for macOS as an add-on creative tool for more advanced photographers who already have a photo-editing workflow they don’t want to change. Luminar comes with a large selection of one-click 'looks', with more available online. Luminar Flex offers the same editing tools as the regular Luminar, with more than 50 filters which can be used individually or in combination, and organised into custom ‘workspaces’ for a cleaner and more efficient workflow. It also has an extensive collection of one-click ‘look’s you can customise and add to yourself. Skylum says Luminar has adjustments and effects that can’t be found anywhere else, including its artificial-intelligence Accent AI and AI Sky Enhancer filters, Golden Hour, Details Enhancer and Image Radiance filters, together with a LUT Mapping tool – LUTs are currently the new big thing in photo editing applications. For the moment, however, current Luminar 2018 and Luminar 3 users can get the Luminar Flex plug-in free. Luminar 3 currently includes plug-in capability but this will be removed with the next major version upgrade to produce two distinct products. Luminar Flex is available from the Skylum website (see the link below).